P/O John Green was posted to 419 squadron on November 19th 1944. He arrived along with the other members of the crew captained by F/L D. B. Hunter after completeing their duties with No. 1664 Conversion Unit . His operations conducted while at No.1664 were an integral part of the training system in place to ensure that the crews were ready for what laid ahead of them. The whole crew had been of fully trained in each of their own trades under normal non-combat conditions. Now came the next step. The Conversion Units brought the crew into tight flying teams on operations sometimes called "milkruns" a term that understates the dangers faces during these operations. Many crews were lost during these operations with HCU, it was training and it was dangerous. As the Flight Engineer, John Green worked closely with the pilot, not only physically, but also in technical aspects of giving the pilot the best that the engines could deliver when needed. Any moment during a mission the pilot could be called on to perform corkscrew or other sudden changes to the aircrafts course or altitude. Working to the right of the pilot with access to his own set of switches and dials located on the starboard side just beneath his position in the "greenhouse" he was also in control of engine throttles, flaps, engine RPM and balancing of fuel tanks while in flight. During the first weeks of being posted to a squadron the crews may have waited for a week or more while their pilot flew as 2nd pilot, sometimes termed "second Dickie" it was yet more preparation for the pilot before captaining his own crew on an operation with the squadron. The other crew members were not idle, each squadron had officers in charge of the different trades in P/O Green's case it would have been the Squadron Engineer. When P/O Green flew his first operational mission for 419 squadron weather conditions were anything but ideal. The operation began just after 1630 hours with the squadron taking off for Osnabructk. For Green it may have been the first operation, for the squadron it was it's fourth mission within 94 hours. 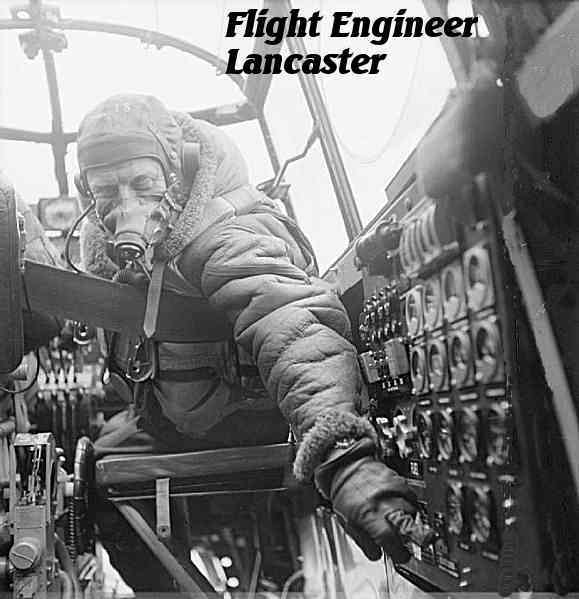 In his F/E position on board Lancaster KB761 (VR-H) headed out on that evening of December 6th. on a route that would take them out over the North Sea with it's ever changeable weather even with out it being winter. Once they reached the set mark the formation would change course on another leg of the way to Osnabructk, for no flight was straight to the target. For P/O Green the view through the windows of the Lancaster's ..... would have presented a stark picture of increasing cloud cover with no chance to avoid the potentially dangerous situation it presented with clouds enveloping not only their aircraft but the others in the skies nearby, Green would be the extra set of eyes the pilot would need to scan the path in front of them seeking out wayward aircraft that could crash into them. All the while the weather was icing up the aircraft, Green would have to divide his time between monitoring his control panel and watching for obstructions ahead. The ice building up on the aircraft surfaces normally the leading edges of wings causes loss of lift, the smooth flow of air passing over the surface changes, leaving the pilot to work harder to maintain height or even sometimes a straight course. Heavy ice can effect the engines propellers and even further cool the lubricating liquids placing a strain on the engines, could effect the flying instruments themselves. In Green's case the ice build up had already cost the Lancaster to loose height they were down to 10,000 feet. Both the pilot and P/O Green the F/E would have been doing everything they could to not loose any further height. Ice blockage of static ports and pitot ports would provide incorrect information to the airspeed indicators and would play a part in the events of that night. Navigation relied on knowing the airspeed to judge their position and the H2S radar dome could ice over giving weak or distorted images to the Navigator. The Pilot decided that my flying on just dead reckoning they would get them to the target 10 to 15 minutes late. So the decision was made to turn back. Jettisoning the bomb load on the way back over the sea. P/O John Green's first operation was one to remember, icing had caused a number of lost air crews and I am sure those thoughts were in the mind of KB761's F/E all during the tense moments during the time that the weather started to build up till they touched down. P/O Green continued with other operations with 419 squadron and now resides in New Brunswick. consists of four rows of four sets of gauges on the upper right hand side. One set for engine oil pressure. one for oil temperature, one for coolant temperature and last row the four fuel tank gauges. To the left of these gauges are the fuel pump switches, fuel pump selector. These are the more important ones. Well some what. During flight the F/E would balance the fuel load between the four tanks to help relief the strain on the wings from the weight of the fuel. This balancing of fuel loads must be carried out with care and is only done one wing at a time. The reason being that the transfer requires fuel valves to go past the "OFF" position to both engines on that wing and you wouldn't want to loose two engines.